MurphyRoom© is unique in the Northwest. We take the Murphy bed concept to the next level. Your MurphyRoom© can be a guest room that converts into a home office; a sewing, quilting, and arts room that turns into a guest room, a home office that doubles as a media center, or a home library that with a few adjustments reveals a office space and a guest bed. Custom design/manufacture/shipping available throughout the US. Contact us for details. All Natural Woods, Moulding, and Laminates are available. At MurphyRoom© we work with you to determine your exact needs and then create the design that is just right for you. Maybe the kids have moved out and you would like to use that extra bedroom for a sewing room while still having a place for your guests to sleep. 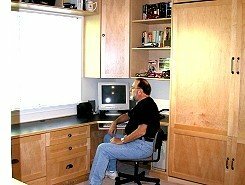 Perhaps you’ve always wanted a home office but didn’t want to dedicate an entire room to computer equipment. Or, if you have limited space in your condominium and would like to make the most out of each square foot. With a custom MurphyRoom©, we will design a space that meets your needs and exceeds your expectations. For a free consultation, please contact us at 1-800-488-3540 or locally at 206-575-4207. Hours: 9 - 2 Mon thru Sat (Please call ahead to verify).